Getting to Palacagüina, Nicaragua is not easy. After a long day of airport navigation, our Special Studies group was still not done; it took another bumpy three hours through the Nicaraguan countryside to get to the small town where we would be staying for the week. When we were greeted at the door by Jaime, our host. Now, it was 1 AM, and we were more than ready for a good night’s rest. Despite my excitement to be in a new place, I fell asleep as soon as I got into bed. Our first day was spent getting acquainted with the town. We immediately were immersed in the culture — we even woke up to go to one of the local churches, where we were all clearly welcomed despite the language barrier. At the church, we picked up the bikes which we were to ride for the rest of our stay and eventually give away to children in need. From there, we rode out to explore the town. Throughout the week, we came to know the center of town well, from the ice cream store to the park to several restaurants that took on the task of cooking food for our relatively big group. Our main destination, though, was a local elementary school, where we cleaned and painted the classrooms, helped build an eating area, and got the chance to make friends with the students. 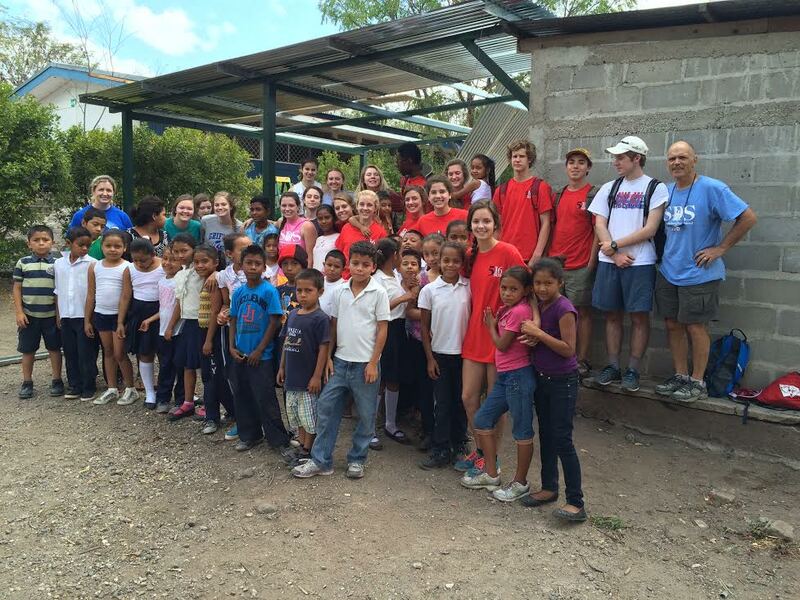 The Nicaragua group, accompanied by some of the schoolchildren they benefited. Although all of the work was rewarding, perhaps the best part was the interaction with the students; during our breaks and their recess, we often played with them, getting the chance to practice our Spanish and to have fun. Although everyone in our group had an impressive takeaway from the experience and it varied for each person, the biggest thing that I noticed came from our time with the students. No matter how much Spanish our students spoke, they fell gracefully into friendships with the Nicaraguan students. The things that they shared — laughter, humor, smiles — went far beyond the language barrier and forged connections which, in such a brief time, were miraculously strong. It’s hard to describe concisely what an adventure this trip was. It was a busy, exciting week full of new cultural discoveries. However, one thing that is certain is that each of us came away with a new perspective on our lives in America and a desire to return to Nicaragua, where we found that despite our many differences, the joy we shared served as a language of its own.